We’re continuing our gastronomic travel days! This time we’re going to intelligent, full of honor and kindness and one of the most polite countries – Japan! We will show you how to cook chicken legs in Japanese most popular teriyaki sauce! This chicken teriyaki is cooked in wild nature, on fire, with organic ingredients and the main chef is our owl – Mr. Ramsay! Though he was too lazy to cook, he allowed us to film him, because owls like to be famous. Fry 2 tbsp. of sesame seeds. Transfer seeds into the wooden bowl. Let’s season the pan. 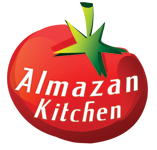 If you’re following our recipes on our official site AlmazanKitchen, probably you should know how to do it. But for the newcomers we will describe how to do it in this recipe! First of all: Put the pan on the high heat. Cover with oil, then drain excess oil from the pan, repeat few times. That’s it! Your pan is seasoned now! Slice fresh ginger. Smash 5-10 garlic cloves. Toss everything into the pan. Let it fry for a few moments. Load the pan with 600g of free-range chicken legs. Fry everything for 3-5 min. Then let it rest for a while. Do not forget to clean the pan! Add 2 tbsp. of wasp honey. 1 tbsp. of soy sauce, 2 tbsp. of sweet vinegar and 1/2 tbsp. of sesame oil. Mix well. Add 1 tbsp. of sake. Yes, it is right! Sake! Mix again. Transfer chicken legs into the pan. Cook, mix and flip for 5 min. It should be all covered in sauce from all sides. Mix water with 1 tsp. of cornstarch. Add it to the chicken legs. Cook for 2-3 min. more. Prepare the clay pot. Fill it with water. Put on coals and boil the water. Add 100g of rice. Cook for 15-20 min. Place rice on the board like a foundation for our dish. Do not hesitate to use sauce left in the pan. Finish off with fried sesame seeds.